Boost the volume of any sound in your headphones. Main features of"Headphones Loud Volume Booster": - Boost the volume in headphonesor earphones; - Boost video sound; - Boost audio books volume; -Boost music volume; - Simple and beautiful design. Download thisapp and enjoy loud music! Smart and simple application for your Android device “SpeakerBooster Full Pro” will help you to boost sound in your speakers.Speaker Booster allows you to boost the sound of music, video andaudio, audiobooks, radio, voice record, notifications in speakersand headphones. If you like listening to music on high volume, butspeakers are not loud enough, then just download Speaker Booster,turn on booster and enjoy loud mp3 music! “Speaker Booster FullPro” can enhance volume of radio and audio books! Just controlstandard volume and boost as you need. Also, if you like watchingvideo on your tablet or phone, but speakers of tablet are not loudenough, then use “Speaker Booster Full Pro”! This app increasesvolume of video, video clip, film, mp4. Increase volume of yourfavorite films, TV series, watch loud video in headphones and inspeakers. If you want to make the notifications louder, then“Speaker Booster Full Pro” is a good help for you! For example, ifyou can't hear incoming call, SMS notifications, you do not wake upon time because your alarm clock is not loud enough, then useSpeaker Booster and you will hear all notifications! You will notmiss calls, SMS notifications, alarm clock! “Speaker Booster FullPro” is the application which makes the sound on your phone andtablet louder. Also, speaker booster can increase volume of soundeven in headphones! If you like listening to music in headset, butvolume is not so loud, then download “Speaker Booster Full Pro” forAndroid and increase volume of audio and video, mp3 music and audiobooks, mp3, wav and mp4, radio and notifications in earphones,Bluetooth headphones, headset, headphones. If you prefer loud musicand you like listening to music in Bluetooth speakers, “SpeakerBooster Full Pro” is able to enhance volume in Bluetooth speakerstoo. Just regulate standard volume and boost music. Invite friends,turn on Speaker Booster, choose popular music and have a party alltogether! Music will be so loud like in a night club or at thedisco! “Speaker Booster Full Pro” can increase volume of sound invideo games. If you listen to music in the street, when you go fora walk with friends, when you ride a bike and you like listening toloud music outside, you can download “Speaker Booster Full Pro” onyou Android, turn on your favorite music, turn on Speaker Boosterand control high volume as you want! Enjoy loud music! * But becareful! Use it on your own risk. We are not responsible for yourgadget. What will you be able to do, if you download “SpeakerBooster Full Pro”: — make the sound louder than standard volume onAndroid; — boost volume of video, mp4; — boost volume of wav audio;— increase volume of mp3 music; — make notifications louder; —enhance volume of radio; — boost sound in speakers; — increasevolume of music in headphones, boost earphones, boost Bluetoothheadphones, boost headpiece; — boost sound in Bluetooth speakers; —high volume of sound; — customize the application as needed; —music application for Android devices. If you set boost to zero,then Speaker Booster Full Pro will be off. The notification icon isonly for ease of launching. If you don't like seeing thenotification icon when Speaker Booster Full Pro is off, just go toSettings and set it to appear only when the app is active. Installthe application right now and enjoy! Listen to loud music, watchloud video! Share “Speaker Booster Full Pro” with friends andlisten to loud enhanced music all together! Boost your Android. Bemodern with high volume speakers. Headphones Volume Booster and Bass Booster is a modern universalapplication, which is able to make the sound louder and bass moreclear. "Headphones Volume Booster and Bass Booster" boosts thesound of audio and video, your favorite music in popular and modernvideo and audio players, you can also listen to louder music inradio and listen to audio books. Also it can increase the volume ofSMS notifications, alarm clock, incoming call and othernotifications. Bass booster will help you to listen to such musicgenres, like Rap music, Hip-Hop music, Rock music, techno music,club music and other kinds of music with beats and basses. BassBooster makes bass and beats louder, more clear and pronounced. Doyou know the secret of great sound in your headphones andearphones? Turn on the button “Bass Booster”, increase the volumeof your music up and enjoy! That is too easy to enjoy your favoritemusic! For better sounding and sound completeness we advise you tolisten to music, radio, audiobooks and watch video using headphonesor earphones. Then the sound will be full in your ears. But foralarm clock, SMS notifications, incoming call and othernotifications you do not need to use headphones or earphones. Justturn on the app by switching the button “on/off” and wait fornotification. So, what will you get, if you download “HeadphonesVolume Booster and Bass Booster”: ♫ Louder sound of music, video,audiobooks, phone notifications; ♫ More clear and pronounced bassesand beats; ♫ Better sounding of your favorite music; ♫ Easy-to-useapplication; ♫ Modern and simple design; ♫ Properly work; ♫Lightweight of app, so the application takes up little memory inthe phone. All you need is to download this application, called“Headphones Volume Booster and Bass Booster”, turn on the app byusing button “on/off”, turn on the Bass Booster also by switchingbutton “Bass Booster is On/Off”, then adjust the standard volume ofsound and, if you are not enough of loudness, boost the sound byregulating the volume track. It is easy to feel more cool only bylistening to music! Control the sound. Listen to what you reallywant. Rule the music. Feel good. Be the King of your phone. Andenjoy cool sounding! You like to cite quotes from great people, sign photos and poststatuses in social network but do not know where to get them?Introduce you the most complete collection of quotes! A huge listof different statements and sayings, photo captions and statuses isalways at hand.You are in love or your heart is broken. You arefond of art, Pablo Picasso is your favorite artist and you haveyour own vision of the world. Or you are an extraordinary person;you see the life in your own way. You live in a modern world with amad pace of life and do not have free time for searching theInternet to find quotes. Then of course you need this app toinstall on your gadget!In the application you can find the beststatuses for social network about love, relationships, happiness,everyday life, success, dreams; clever and deep sayings of manyscientists, famous people, celebrities, rulers; motivations, humorand inspirations. Choose the best for your beloved.Here arefeatures of quotes, statements, photo captions and statuses:• Getquotes, statements, photo captions and statuses in easy way• Worksoffline• More than 10,000 quotes and 700 authors• You can choosethe order of quotes by yourself: in random order or by popularity•Ability to search for a favorite author's quote in the application•You can share quotes via Twitter, Facebook, Viber, Reddit, Tumblr,Linkedin and other sharing apps • You can copy status for pastinganywhere• Simple control and interface, modern enjoyable MaterialDesign • And it is totally free and without ad!Our collection has700 authors and more than 10,000 quotes and this list constantlyupdates. Here are some of the authors:1) Dr. Seuss 2) MarilynMonroe 3) Oscar Wilde 4) Albert Einstein 5) Frank Zappa 6) Mae West7) Mahatma Gandhi 8) Robert Frost 9) J.K. Rowling 10) C.S. Lewis11) Albert Camus 12) Eleanor Roosevelt 13) Mark Twain 14) MayaAngelou 15) Martin Luther King Jr. 16) Friedrich Nietzsche 17)Ralph Waldo Emerson 18) Stephen Chbosky 19) Jane Austen 20) JohnGreen 21) William Shakespeare 22) Neil Gaiman 23) Groucho Marx 24)Douglas Adams 25) Mother Teresa 26) Sarah Dessen 27) Lao Tzu 28)George R.R. Martin 29) Robert A. Heinlein 30) Suzanne Collins 31)Anais Nin 32) Charles M. Schulz 33) Pablo Picasso 34) LemonySnicket 35) Woody Allen 36) Nicholas Sparks 37) Bob Marley 38)Haruki Murakami 39) Markus Zusak 40) Abraham Lincoln 41) VirginiaWoolf 42) George Bernard Shaw 43) Shel Silverstein 44) Jodi Picoult45) Helen Keller 46) Stephenie Meyer 47) Ernest Hemingway 48) A.A.Milne 49) Terry Pratchett 50) Charles Bukowski 51) Alfred Tennyson52) Winston S. Churchill 53) Cassandra Clare 54) Bill Watterson 55)J.D. Salinger 56) George Carlin 57) John Lennon 58) J.R.R. Tolkien59) Ayn Rand 60) E.E. Cummings 61) J.M. Barrie 62) Veronica Roth63) Toni Morrison 64) Khaled Hosseini 65) Paulo Coelho 66) HarperLee 67) Anonymous 68) Lewis Carroll 69) Chuck Palahniuk 70) KurtVonnegut 71) Aristotle 72) Stephen King 73) Pablo Neruda 74) RitaMae Brown 75) Edgar Allan Poe 76) Roald Dahl 77) Socrates 78) AnneFrank 79) Victor Hugo 80) Audrey Hepburn 81) Isaac Asimov 82) DalaiLama XIV 83) Jonathan Safran Foer 84) Leo Tolstoy 85) Rainer MariaRilke 86) Rick Riordan 87) Mitch Albom 88) Ray Bradbury 89) GeorgeOrwell 90) Charlotte Bronte 91) F. Scott Fitzgerald 92) RichelleMead 93) Plato 94) Aldous Huxley 95) Elizabeth Gilbert 96) Voltaire97) Henry David Thoreau 98) Emily Dickinson 99) Milan Kundera 100)Walt Disney What are you waiting for? Get this brilliant app rightnow! We introduce you the most addictive and compact game «Simple SnakeGame”!It is easy to start, but difficult to stop playing.Featuresof the game:• Push the arrows “turn right” or “turn left” to directthe snake;• Collect as many apples (red dots) as you can; •Orientation relative to the snake;• Try not to crash into the wallor into the tail;• Play infinitely;• Reach the highest possiblescores and compete with friends;• The game is absolutely free andwithout advert!Download this addictive game and play wherever youare boring! If you are a fan of Hip-Hop, loud music, hard music, rock, beat orbass music — then this application is right for you. “Bass Boosterfor Headphones” is a musical app for increasing loudness of lowfrequencies on Android device. Enhance low frequencies, boost bass,enjoy new music with loud bass and beats. This bass booster willhelp you if you listen to hip-hop music, Rap music, drum and bassmusic, music with beats and bass. Use bass booster for increasingvolume of bass and beats in Hip-hop music, rap music, drum and bassmusic. Use headphones, earphones, ear pods for better sound.Increase volume of bass in audio and video on Android phone orAndroid tablet . You can also listen to bass music in speaker. Bassbooster for headphones enhance volume of bass both in speakers andearphones. Although, bass booster for headphones is able toincrease loudness of bass in Bluetooth speakers and Bluetoothheadset. We advise you to listen to bass and beats music inheadphones for better sound. Bass Booster for Android phone andtablet is a simple, but useful app. It helps you to increase bassof your favorite music, make beats and bass more clear and louder.Change them on your own taste. This musical app Bass Booster forHeadphones increases low frequencies and make the sound clear.Musical app for Android “Bass Booster for Headphones” will help youto make bass of video and audio louder. If you watch video clip ofyour favorite song, but the sound is poor, then use “Bass Boosterfor Headphones” to make bass louder! If you listen to music invideo player, but video has not deep bass, then turn on BassBooster for Headphones, increase volume of bass as you need andenjoy loud music with loud bass! Bass and low frequencies will beboosted because “Bass Booster for Headphones” can enhance bothaudio and video! Use this musical app for bass boost for increasingvolume of bass for video and music. With Android app “Bass BoosterFor Headphones” you can make bass louder than standard volume ofbass. Just control bass inside the app “Bass Booster ForHeadphones” as you want! Also, the musical app “Bass Booster ForHeadphones” can change standard volume. You can change standardvolume in this app if button on the side of your Android phone ortablet is broken. Or you can change standard volume in “BassBooster For Headphones” because it is comfortable and useful.Inside musical app for Android “Bass Booster For Headphones” youcan regulate standard volume and bass boost. It is comfy to controlall sounds inside this app “Bass Booster for Headphones”. Turn“Bass Booster for Headphones” on by swiping the button from whiteto green, slide a regulator of volume and bass regulator to theneeded loudness level and enjoy the music or video. Application“Bass Booster for Headphones” has a simple design. You can usenotification icon for fast access to Bass Booster for Android. Whatcan application for Android “Bass Booster For Headphones” do: *boost bass in Android device; * increase low frequencies of Androidphone; * enhance bass in hip-hop music, rap music, drum and bassmusic in Android tablet; * make bass in audio and video louder inAndroid gadget; * boost low frequencies of music in Bluetoothheadset and Bluetooth speakers for Android; * free bass booster forAndroid. Install this application and enjoy the music with bass andbeats. Share with friends and listen to popular Hip-Hop musicians,Rap music, drum and bass beats. Control bass as you want. Increaseloudness of bass in audio, music and video. Regulate standardvolume of your Android device. But be careful! We are notresponsible for your phone. Don't listen to music with the highestlevel of bass for long time. “Photo Editor with Filters and Stickers” is an application that canhelp you to decorate your photo, add stickers, expressions,hashtags; quotes and phrases about love,lifestyle, holidays. Chooseone or some of them from the list, resize a picture and set to theplace you want.What do you feel? Maybe you feel good, or you lovesomeone, or you want to tell something special to somebody, but donot know, how to do it in an unusual way?Use the stickers! Theywill help you to stand out from the crowd, breathe new life intoyour pictures and photos! Be unique!It is simple to work with thisapplication. Choose the filter, tap on it, regulate the intensityby controller travel to the left or to the right. Easy to use!Forsize changing of stickers, masks, phrases, statuses and quotes tapthe chosen one, put your finger in the bottom right corner in thesmall circle and pull it for resizing.If you want to delete thechosen sticker, mask, phrase, status or quote, then click on thecross in the upper right corner.Mix stickers, statuses, quotes,masks up as you like! Surprise your friends!You will find a lot ofdifferent quotes, statuses, words and phrases about differentholidays.For example, New Year, Christmas, Valentine's Day,Birthday. Different phrases about lifestyle, love, friendship,relationship, partying, music.There are a lot of impressions, likeOMG, WOW, OK, YES, NO and so on in the “Photo Editor with Filtersand Stickers”,different colorful things for creation modern coolbeautiful photo.Use them to impress people, who will see yourphoto, to express your emotions and feelings, to show, who youare!Also in this app there are a lot of filters, settings for photoeditor. You can apply a filter and adjust filter intensity, changebrightness, hue, vignette, sharp;enhance saturation, temperature,tint.It is possible to make a picture black and white, or morebright, clear, beautiful, perfect and better!You can resize photoas you wish, any size you want. Also, is it easy to transform yourphoto by rotating.“Photo Editor with Filters and Stickers” allowsyou to write an inscription on your photo or draw anythingIf youlike your created photo, then you can share your picture with youfriends in the most popular social networks.You even may save thepicture on your phone.Also, Photo Editor with Filters and Stickersis an absolutely free application! You do not need to pay for yourcreation.So, what will you get if you download this application:—ability to choose and apply a filter and adjust it as you need;—ability to change the brightness, temperature, hue, vignette, sharpof your photo; you can also enhance tint and saturation of thepicture; apply black-and-white filter;— ability to resize andreshape the picture as you wish;— ability to draw and writeanything you like;— ability to set stickers, masks, phrases, quoteson your pictures, change their size and set in the place you need;—lightweight application;— free app;— easy you use;— moderndesign.If you like to design photos, decorate pictures and createunique images, then download “Photo Editor with Filters andStickers”.Enjoy the stickers, masks, quotes and filters!Be who youwant to be. Volume boost “Loud Volume Booster for Speakers” helps to enhanceloudness of video, audio, all notifications on Android. Why do youneed loud volume booster for speakers? You turn on film or video onyour Android phone or Android tablet, but you hear nothing? If youhave to strain your ears, but anyway the sound of video is not loudenough? If you turn on your favorite music in speakers, if you wantmusic to be loud, but speakers are not loud? What to do if yourAndroid is not loud enough? You do not have to buy Bluetoothspeakers, you do not have to buy new Android. All you need is todownload application for loud volume “Loud Volume Booster forSpeakers” for Android device, turn on video, music, controlstandard volume and boost as you need and enjoy loud video and loudmusic! Why do you need loud volume booster for headphones? You goby bus, you go for a walk and there are a lot of people around youand you can't enjoy your favorite music, interesting audiobook,exciting film or video. Now there is a solving! You do not need tobuy new earphones, expensive headphones, you will hear quiet video,you will hear quiet music, you will hear quiet audiobook, you willhear quiet alarm clock, you will hear quiet notifications! All youneed is to download “Loud Volume Booster for Speakers”, turn onmusic, audio, video, audio books in headphones, control loudness ofvolume and enjoy every loud sound that you will hear! Loud VolumeBooster for Speakers increases volume more than standard loudnessboth in speakers and earphones. Insert earphones, turn on yourfavorite song, turn on Loud Volume Booster for Speakers andregulate standard volume and booster as you want! Be careful! Weare not responsible for your device and health. Do not listen tomusic in headphones for long time using headphones. You can controlnotification bar in settings of the application for volumeincreasing “Loud Volume Booster for Speakers”. Controlnotifications to always appear, never or when the speaker boosteris active. You can choose Soft Boost if some noise appears duringlistening to music on high volume. Soft boost can make boostsofter, hide noise and interference during enhancing volume onAndroid phone or Android tablet. Also, you can choose maximumallowed boost in the settings of loud volume booster for speakersand earphones. Maximum allowed boost can be from 10% till 100%.Choose maximum allowed boost depending on the abilities of yourspeakers and headphones. If you are into audio books, podcasts,radio, then the app “Loud Volume Booster for Speakers” will helpyou to enjoy loud aidiobooks, loud podcast, loud radio. If you arenot enough of standard volume of your Android phone or Androidtablet, then download Loud Volume Booster for Speakers and enhanceloudness higher than standard volume on Android device. What willyou have after downloading Loud Volume Booster for Speakers: *standard volume booster of music and high volume booster of music;* volume booster of online music; * high volume boost of audio andall sounds on a phone or tablet; * loud volume boost of video andfilms on Android device; * loudness booster of notifications andalarm clock on Android phone and Android tablet; * high volumespeaker booster; * volume enhancer for headphones, earphones,Bluetooth ear pods, Bluetooth speakers. Download high volumeenhancer for audio and video Loud Volume Booster for Speakers forAndroid and forget about problem of quiet speakers and quietheadphones. Listen to music in every place anytime with anyloudness! Control any volume you want — loud or very loud! Listento music using earphones! Watch loud video in earpods! Share “LoudVolume Booster for Speakers” with friends! Do not forget to give5*! Bass booster & music volume equalizer for Android Control yourmusic volume, boost your music and amplify your audio with MusicVolume EQ. Listen to the top songs in your music library with theBEST audio control & bass booster app for Android! Music VolumeEQ has various features including: live music stereo led VU meter,five band Equalizer, amp, bassboost, 3D virtualizer, slider volume& audio control. To get the best results, pair Music Volume EQwith your best headphones. If you don’t have a pair of headphonesor if you want to use a speaker, you can still enjoy good musicwith our app. Music Volume EQ is also a great speaker booster andbass booster if you use a Bluetooth speaker to listen to music. Allof us install Android music player to play top songs in our musiclibrary. We hope to listen to good music with high quality sound(maybe even surround sounds like in when you are in surroundtheaters!). However, even with the most advanced mp3 music player,you will still high quality audio control app to get the bestsound, even if you are using the best hifi headphones in themarket. That’s why you need Music Volume EQ, the best audiocontrol, speaker booster, amplifer, and equalizer! You can adjustand amp audio and also enjoy live visual with our 3D Virtualizer. ΞFeatures of Music Volume EQ – Sound Booster Equalizer: ✔ Mediaaudio control ✔ Five band music equalizer ✔ Bassbooster effect -speaker booster ✔ 3D Virtualizer effect ✔ 9 equalizer presets withCustom Preset ✔ 2 themes (Classic and Material theme) ✔ Listen togood music whatever audio player you use ✔ Stereo led VU meter ✔Home screen widget ✔ Lock media volume ✔ Loudness enhancer - Volumeboost amplifier (Only for Android version 4.4 and higher) ✔ Greatfor hifi headphones ✔ Circular music beat bars ✔ Video volumebooster ✔ Audible sound spectrum ✔ Live Wallpaper Our app iscompatible with most Android music players, audio player &video players. That means you can still enjoy good music with yourfavorite MP3 Music player and audio player to play your top songsfrom your song library. It just takes a few simple steps to enjoysurround sound just like in surround theater from your phone. Ξ Howto install & use: 1. Put on your best headphones 2. Turn onyour Android music player or MP3 music player to play top songsfrom your music library. 3. Open Music Volume EQ and adjust soundlevel and frequency. 4. To save custom preset press Save Preset onthe list and type preset name. To delete preset, long press presetsname and delete. 5. Select your preferred theme: Classic orMaterial 6. You can switch to full-screen visualization and enjoyin a stereo sound booster. 7. To close the application and removefrom Status Bar long press app power button. So, what are youwaiting for? Are you ready to immerse yourself in the best qualitysurround sounds like in Surround Theater? Do you want to enjoy thebest hifi quality sounds on your headphones? Simply download anduse Music Volume EQ now for FREE! We hope that you enjoy our soundbooster equalizer app! If you do, please take a minute to supportour app by leaving a rating and review. Volume Booster will improve your android listening experiencesubstantially. This free volume boosting app uses sophisticatedmethods to really give you loud, enhanced sound.Volume Booster isreally able to make your sound louder - it's not a volumecontroller, not a music player, it's a free booster app thatenhances sound volume and enables you to experience as muchloudness as possible.If Volume Booster doesn't work on your device,make sure you don't have any other volume boosters or audioboosters, enhancers active. If that doesn't help, try using adifferent media player.Remember that Volume Booster works best withheadphones!Use at your own risk and enjoy the free Volume Booster!If you like Volume Booster, please rate and tell your Facebook,instagram and Google+ friends so they can also enjoy the loud,boosted sound. Precise Volume is a fully-featured volume control hub.Too loud? Notloud enough? Never again will this be a problem!Precise Volumeoverrides Android's 15 volume steps limit, giving you 100 differentvolume levels. Other apps simply give the illusion of having morevolume steps. Precise Volume safely hooks into your device's audiosystem to give you more volume control options!But Precise Volumedoesn't just give you more fine control over your volume -- it canalso make your life easier by automatically setting volume for youwhen you need it most. Set up Automatic Volume (PRO feature) toautomatically set volume for different pairs of headphones,bluetooth devices, apps, and more! Also, you can make it so thatwhen you plug a device into your headphone jack, a dialogautomatically pops up asking you which headphone preset to use. Nowalso featuring a 5-band Equalizer with a bass booster, soundamplifier, and Equalizer Presets!And all of these features comewith the added bonus of having truly fine-grained control over yourdevice.PRO users can have up to 1,000,000 precise volume levels.Insanity!No Root Required!• Doesn't even need root. How neat isthat?Limit volume and protect your hearing!• Features a niftyvolume limit feature for headphone use.Tons of settings!• PreciseVolume is extremely customizable, allowing you to tweak settings tofit your lifestyle.Custom Volume Presets• Presets allow you toquickly and easily set your volume for different situations, suchas: with specific pairs of headphones, while plugged into an AUXcord in your car, etc.Automate everything!• Activate presets whenheadphones are plugged in, bluetooth is connected, an app isopened, etc. (PRO)Fully-Featured Equalizer• Adjust sound how youlike it! Create equalizer presets for all of your favoritegenres.Bass Booster• Perfect for bass lovers! (Part of theEqualizer. )Volume Booster• Boost volume higher than Androidnormally allows! (Part of the Equalizer. )Lock Volume Buttons toMedia• Force volume buttons to use Media by default instead ofRinger.Precise Volume PROUnlock the following features bypurchasing PRO:• Volume Control Notification - Show an ongoingnotification with volume controls, giving you quick access toPrecise Volume.• Screen Off Override - Override system volumecontrol behavior while your screen is off or in your pocket. Veryuseful for people who listen to music/podcasts/etc with theirscreen off.• Automatic Volume - Activate presets automatically whenheadphones are plugged in, bluetooth is connected, an app isopened, etc.• Volume Button Override - Let Precise Volume controlyour volume buttons from any screen!• Max Volume - Change thenumber of volume steps. You can change it to anything between 0 and1,000,000! By default, Android comes with just 15!• Volume ButtonIncrements - The amount of volume that will be changed when thevolume buttons are pressed.• Dark App/UI Theme - Enables a darkapp/UI Theme - perfect for night viewing and devices with OLEDdisplays!• Audio Curve - Change how slowly or quickly volume goesfrom minimum to maximum.• Combine All Volumes - Changing the volumeof any spectrum will automatically change ALL of the other volumespectrums to match it.• More features added all the time! - Sendyour suggestions to [email protected]!PermissionsExplained:Internet - For ads and in-app purchases.Modify AudioSettings - Obvious! :)Billing - For in-app purchases.Receive BootCompleted - For starting enabled services back up after areboot.Wake Lock - Firebase SDK.Access Network State - FirebaseSDK.Wi-Fi State Change - For the Wi-Fi Automation feature.Bluetooth- For the Bluetooth Automation feature. Super Loud Volume Booster will make your phone sound and overallvolume stronger by 30-40% depending on your device. Features ofSuper Loud Volume Booster: ➤ Volume Booster ➤ Equalizer soundbooster ➤ Does not distort sound while boost sound volume ➤Flexible Control ➤ Customize sound for many applications ➤ Turn on/ off music player with volume boost ➤ Music amplifier equalizersound booster to listen to music louder ➤ Several preset equalizersound booster and music player ➤ Boost bass and volume booster loud➤ Virtual effect ➤ Totally Free Download this useful Volume Boosterfor free now! Please give us feedback about any issue or problemwhen you use. Don't forget rating for us 5 stars to improve SuperLoud Volume Booster. Volume Booster - Amplifier Volume is Simple, small, free app toboost your speaker or headphone sound volume. Useful for movies,audio books and music. Volume Booster - Amplifier Volume is anexcellent volume control app that controls Android phone volume forall sound streams(music, voice, alarm, system). Volume Booster -Amplifier Volume is a volume slider with live music stereo led VUmeter, and five band Equalizer, with Bass Booster and 3DVirtualizer effects. You are unable to independently adjust themusic volume, alarm volume, call voice volume and other systemvolumes. Thanks to this Phone Sound Booster, you can easily adjustall these in few seconds. Volume Booster will increase yourspeakers volume up to 70-80%. Your phone is not only amplifiedmusic and volume louder but also the quality of sound is betterthan the original. The sound booster for android does not distortwhen the amplifying sound to its highest level by effectivemonitoring functions. Improve the sound quality of your androiddevice with the first true global Equalizer, Bass Boost andSurround Sound. 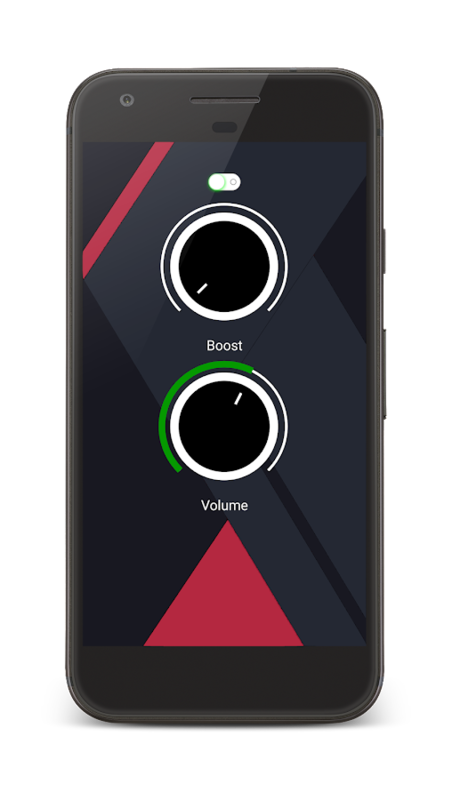 Equalizer & Bass Booster lets you adjust soundeffect levels so that you get the best out of your Music or Audiocoming out of your phone. Free Live Music Player is a stunningMusic Player, beautifully crafted with Material Design in mindSupport formats: MP3, MP4, MP2, MP1, OGG, WAV, AIFF, MIDI, AAC,3GP, XM, IT, S3M, MOD, MTM, UMX, MO3, MP4, M4A, OTA Main Feature:Media Volume control ✔ Five band music Equalizer ✔ Bass Boosteffect - speaker booster ✔ Virtualizer effect ✔ Speaker of phone ✔Bluetooth Headset ✔ Headphone volume booster ✔ 9 Equalizer presets✔ Stereo led VU meter ✔ Loudness enhancer - Volume boost amplifier(Only for Android version 4.4 and higher) ✔ Bass booster forheadphones ✔ Ringtones MP3 Play your local songs ✔ Amplifier forheadphones ✔ Sound equalizer ✔ Music Amplifier ✔ Musicvisualization ✔ Equalizer sound booster ✔ Audible sound spectrumFeature: 1. Increase all sound stream volume to maximum, no need toindependently louder speaker volume, loud alarm clock, loudringtones, or louder music volume etc. 2. Turn your phone intosilent mode, it is so convenient when you are on a meeting or goingto bed. 3. Music sound Increaser with music equalizer volume boost.5. Improve Sound Quality - Bass boost & Virtualizer effect,Stunning visual sound spectrum 6. Sound louder and sound enhancerfor android without distorting tone. 7. Enhance bass, music boostervolume loud and other sound effects. 8. The "System Sound" in thisSpeaker Booster include ringtone sound, notification sound, DTMFand other system sounds. You can choose three types of Volume to beboosted: * Media player volume * Ringer volume * Alarm volume *Notification Volume * System Volume * Enable or disable VolumeBoost from active notification * Control Volume Booster from yourandroid device. * Start your favorite music player directly fromVolume Booster. Amplifier Volume and Bass Booster Music Playerallows you to adjust your sound volume with a five-band equalizer.Volume Booster provides 9 professional music genres presets foryour choice, They are Hip-hop, Rock, Dance, Pop, Latin, Metal,Classical etc. Equalizer presets based on music genres There are 10professional music genres presets for your choice, they areHip-hop, Rock, Dance, Pop, Latin, Metal, Classical, Flat, Normal,Custom. Volume Booster with music stereo LED VU meter The musicstereo LED VU meter will let you enjoy the vision and sound of mp3music in the same time. Improve Sound Quality - Bass boost &Virtualizer effect Thanks to the professional audio decodingtechnology, the bass booster and virtualizer will improve yoursound quality to led you enjoy the best music free. Volume SoundBooster is free and will always be like that.